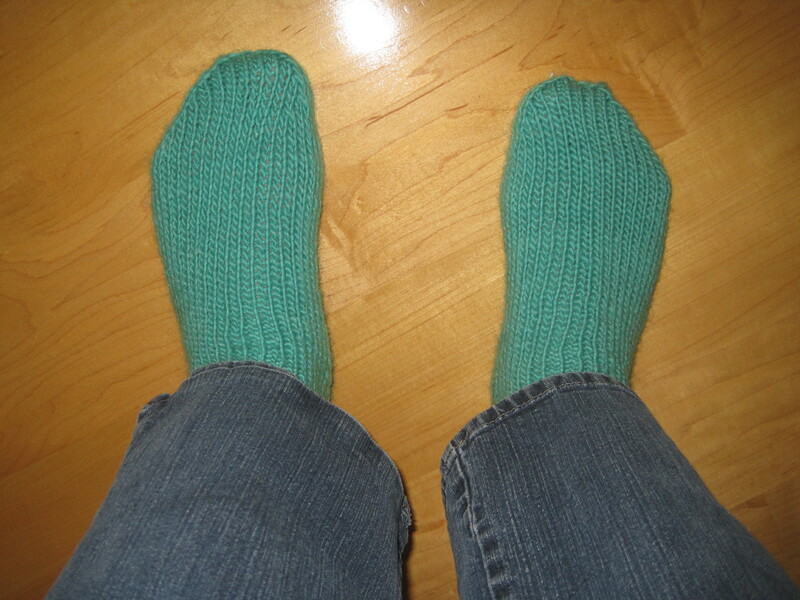 Clump #11: Finish knitting long-neglected sock. Writing about The Cob Studio in the previous post made me think of how I got to know Cara Graver. About a year ago she was at a farmer’s market displaying her wonderful pottery. I picked up one of her brochures, learned that she taught sock-knitting, and to sweeten the deal, tea and scones were included. My kind of class! I’ve been wanting to knit socks for a long time. I belong to a loosely formed, but very loyal, group of women from our Quaker Meeting called Sewing Group. Companionship, news of the day, problem solving, and laughter knit us together (sorry, pun intended). Sewing is not required, but there are some serious needlework mavens in the group who churn out socks like nobody’s business. Intimidating. 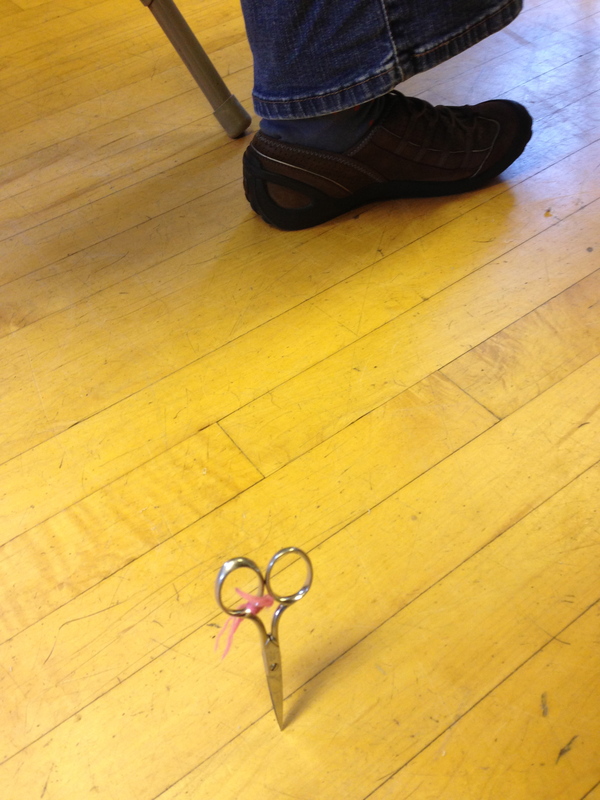 One such maven accidentally dropped her sewing scissors on the floor the other day. This is how they landed. Sewing Ninja? Cara gave our class wooden dowels she had cut into needle lengths. We sanded them until they were sharpened and smooth. 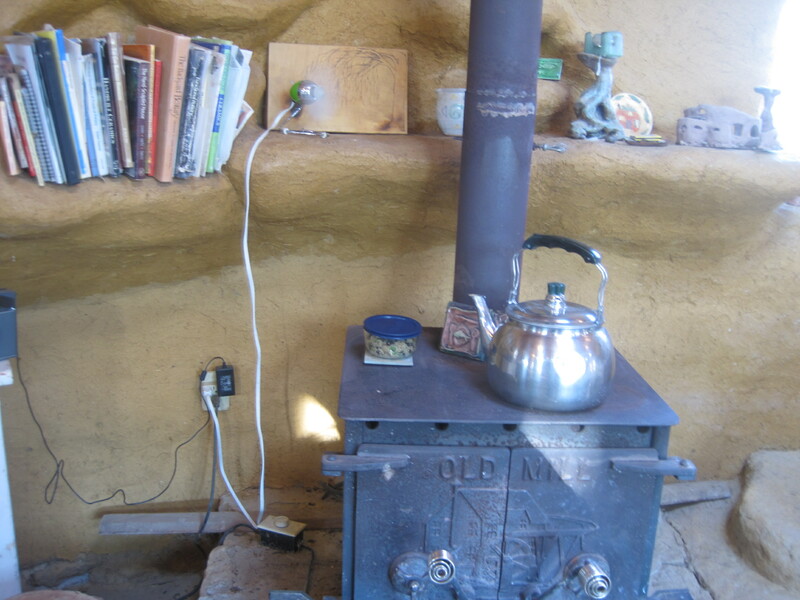 Then she taught us the joys of sock knitting in the warmth of her wood stove, tea and scones at hand. 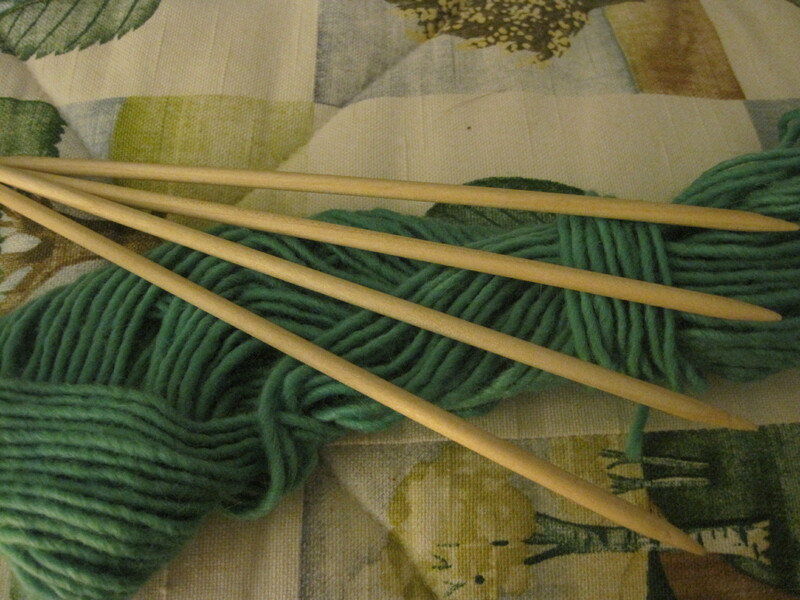 “If you can knit socks, you can knit anything,” she exhorted. Wow. I finished one sock in the class, got a good start on the other one at home, and then …… Procrastination set in, mixed with bad memory (how did I do that? ), fear, perfectionism (Cara would say, “It’s only a sock! It will be mostly under your pants and shoes.”), and basic insecurity. 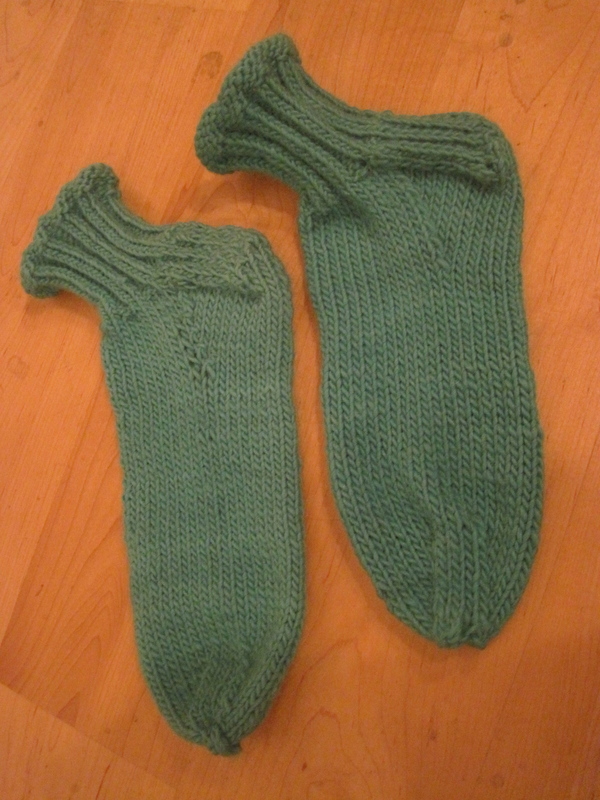 But yesterday, inspired by the post on The Cob Studio, and with the calm, cool, help of my younger daughter, I got the orphaned sock out and finished it — I actually finished it! This might not seem like much to the average person, or sewing maven, but to me it’s a miracle clump! It only took a year! I put the pair in my sock drawer, and was shocked and delighted this morning at the sight of something I had made sitting sweetly there. Amazing! 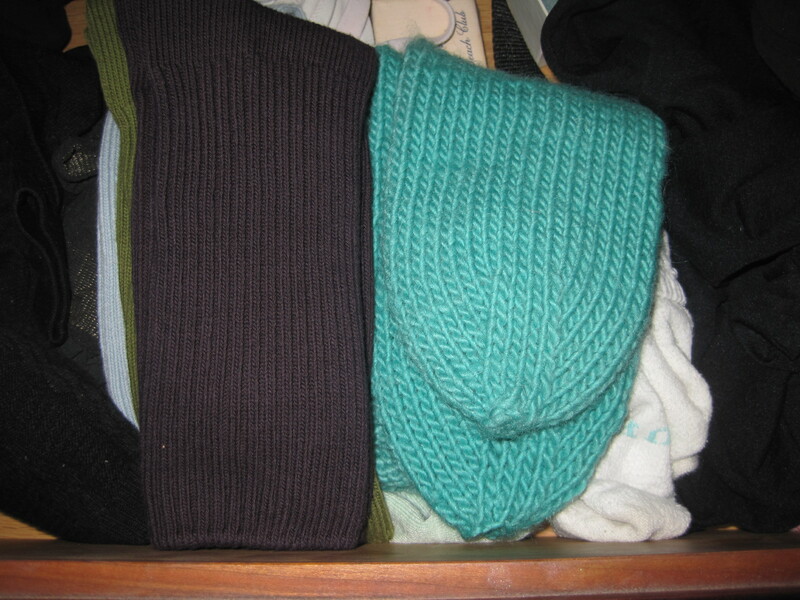 Maybe because I had that light teal color on the brain, I realized I was already wearing a top of the same shade. I tried to take a photo containing both, but the front of me at that angle was pretty horrifying — delete, delete!! You’ll just have to take my word for it.